Sallamah's Suq or Market Place gives you an overview of what we offer at the studio. We shop for the best prices to offer our students affordable, high quality belly dance supplies that will take them from the classroom to their first performance. 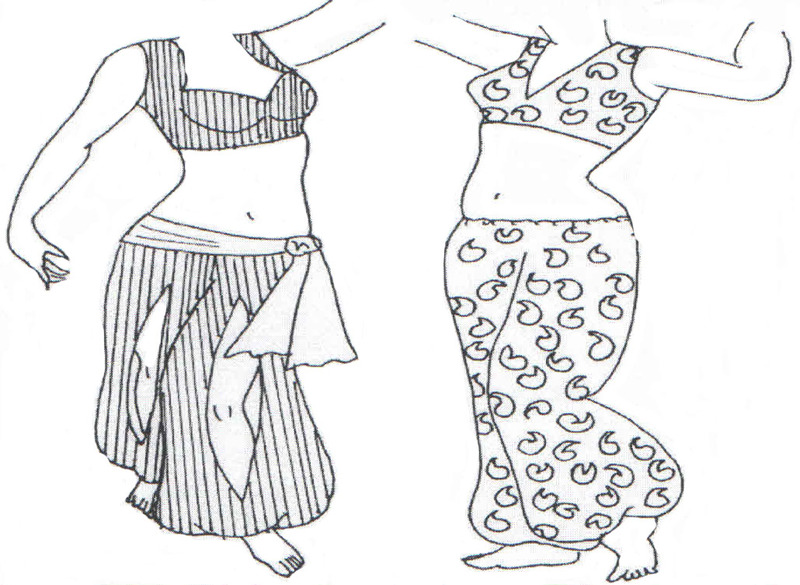 See our "What to Wear" page for more information about belly dance class attire. We carry coined hip scarves, CDs and DVDs with class music and choreography, Grecian dance sandals, and Turquoise finger cymbals (zils). We also have costume patterns and a costuming book with more than 100 pages including patterns, what materials to buy, and how much fabric or trim you will need. We also take belly dancing apparel and supplies on consignment. We carry a variety of reasonably priced hip scarves for our students in regular and plus sizes. Styles vary with each shipment, but we mostly have rectangular scarves and sometimes velvet ones. To some extent we can do special orders. 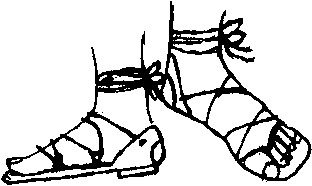 We carry dance sandals, sizes 5 to 11 for $34.00 (not including sales tax). The sandals protect your feet and if you have foot problems, you can use Dr. Scholl's inserts as well as heel and arch supports for added comfort. We have CDs with the Beginner, Intermediate and Advance/Troupe Class Choreography music starting at $3.00. You may try to download this music but we have altered some of the songs for our dance routines and some are no longer available. For a easy approach to learning belly dance, Sallamah Chimera has produced her own instructional DVD,"Belly Dance Basics: A Home Study Companion" with Chapters for easy use. This is a one hour 30 minutes video covering all the basic movements and isolations used in belly dance classes. Practice your moves at home between classes. $21.20 (includes tax). Ethnic Dance Expressions videotapes their performances and puts them on DVDs. 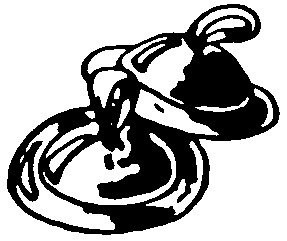 Our dance shows include: SFC Spring Arts Festival, Micanopy Fall Harvest Festival, etc. for $5.30 (includes tax). We also have our annual two hour "Veils & Visions Belly Dance Revue" (2003-2011) and our one hour 2012 "Cafe Cairo" show for $12.72 (includes tax). Attend Sallamah's Costume Workshops and learn to sew basic costume items like harem pants, veils, and circle skirts to more advanced costuming like bras and hip belts as well as boleros, fancy skirts, dresses and more. See our Costume Workshop Description to learn more about the class and what to bring. Can't make it to the Costuming Workshop? have the jitters about making your costume and want some expert advice on how-to? 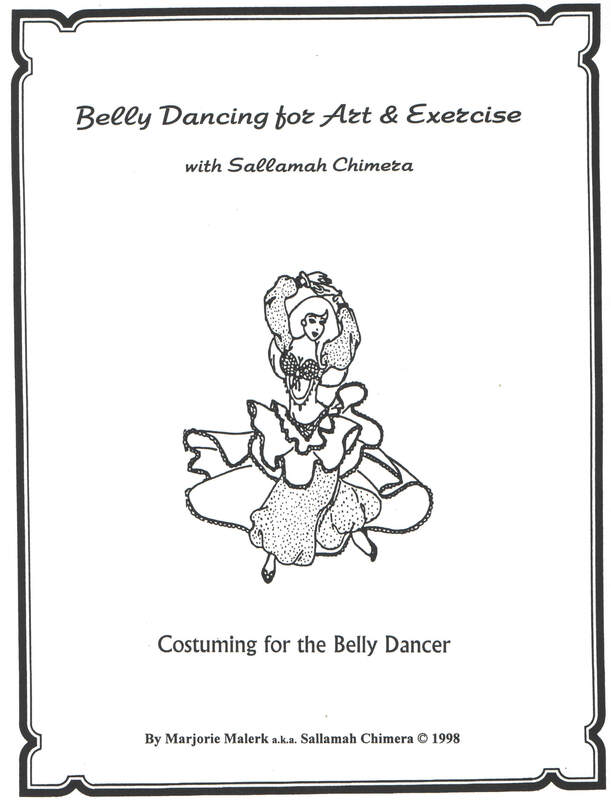 Sallamah Chimera's, "Costuming for the Belly Dancer" has over 100 pages of detailed written and visual instructions, ideas and patterns for making Belly Dancing costumes. A must have for the beginning to advance dancer and sewer. Sallamah has compiled over 35 years of costume and pattern making experience into this book Sallamah has published excerpts of the costuming book in JAREEDA magazine and now you can have the complete benefit of this knowledge. 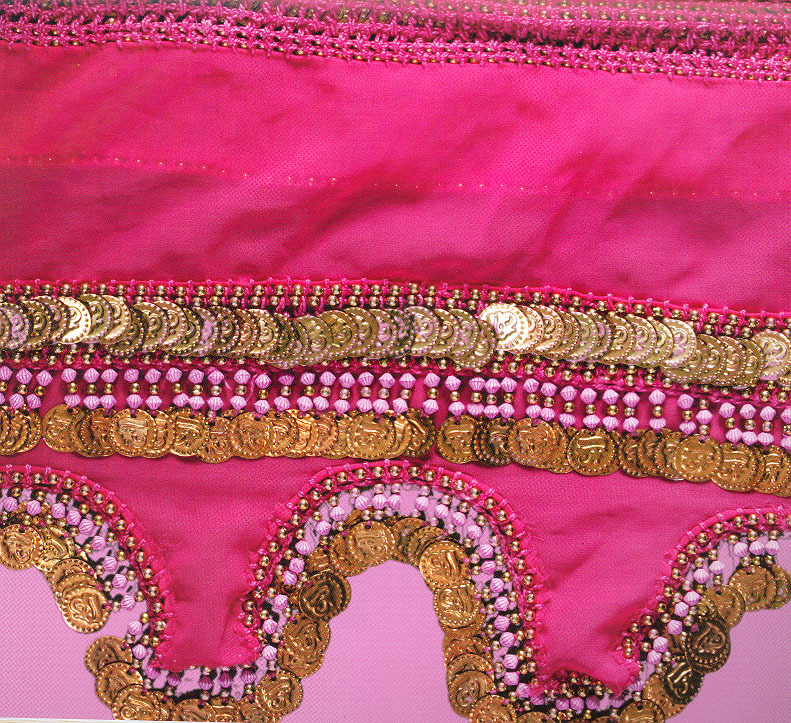 "Costuming for the Belly Dancer" lists what types of fabrics and trims to use, how much to purchase and pointers for selecting a costume bra. 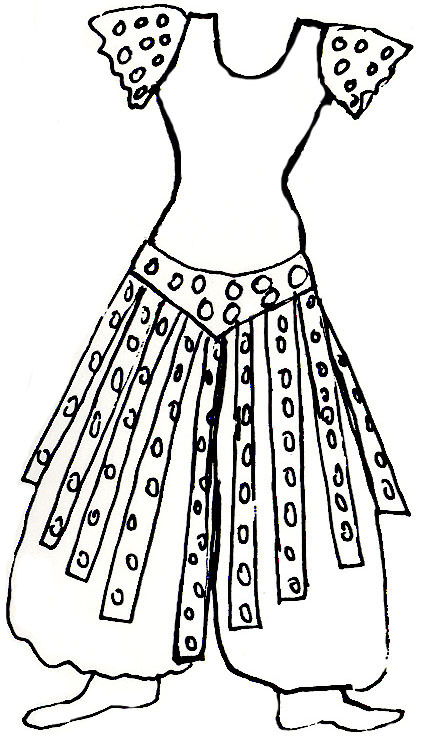 It includes worksheets for determining how wide of an opening you will need on a circle skirt and how to get well fitting harem pants. It shows the basics of bead work, how to sew on coins for the Tribal look, and how to sew-on sequ9in rope. It covers making your bra and hip belt, a variety of skirts, beledi dresses, caftans, blouses, sleeves, harem pants and veils. 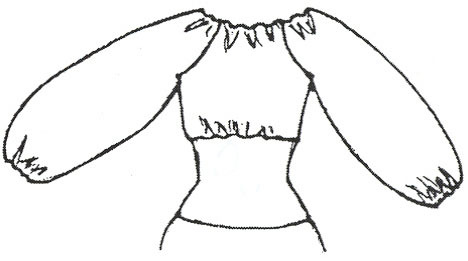 The book also includes patterns for a side closing hip belt, hip sashes, scallops for veils or skirts, a basic vest, bra cup inserts, and various types of sleeve ruffles. Cost $35.00. 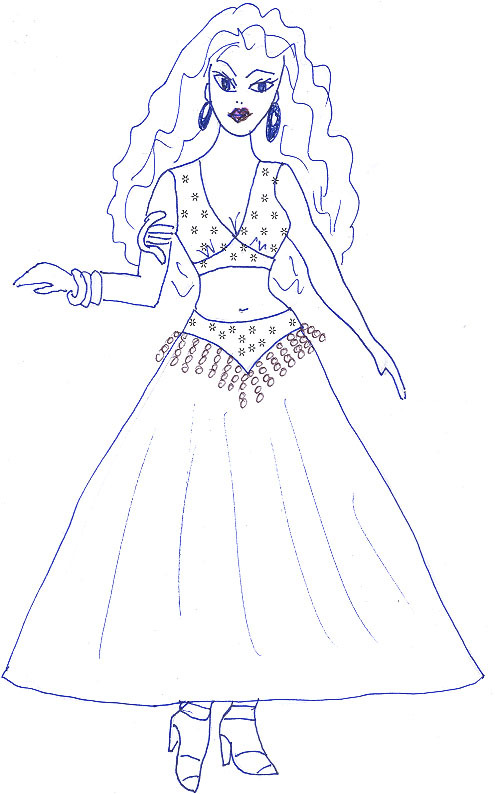 Here are several of Sallamah's basic, easy to sew Belly Dance Costume Patterns to help you create your own unique and custom fitted costume.